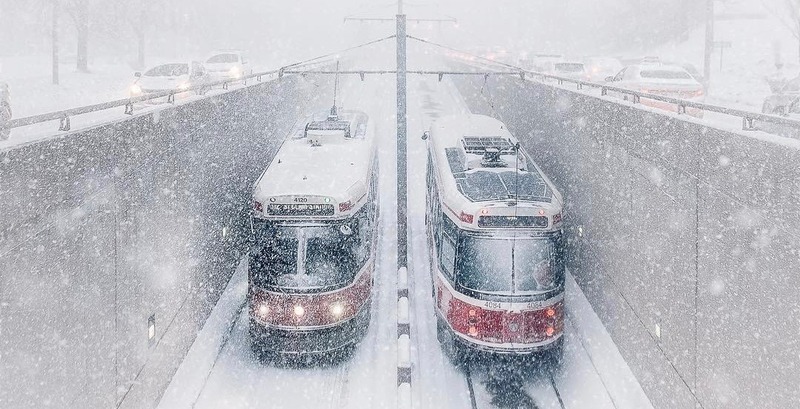 Following an extreme cold alert issued by the City of Toronto, Environment Canada has issued a winter storm watch for the region. Snow is expected to begin early Tuesday morning, and will mix with or change to ice pellets later in the day. There will also strong winds gusting to 80 km/h, which can cause reduced visibility in blowing snow. “Total snowfall and ice pellet amounts of 15 to 25 cm are possible before ending Wednesday. There is also a risk of freezing rain,” states Environment Canada. Localized power outages possible, and they warn that rapidly accumulating snow could make travel difficult over some locations. Visibility may be suddenly reduced at times in heavy snow, as well, surfaces such as highways, roads, walkways and parking lots may become icy and slippery. Expect a significant impact on rush hour traffic in urban areas. Environment Canada forecasted that Toronto will see some flurries today, with temperatures falling to -2°C this afternoon, but it will feel more like -12°C with the windchill. By tonight, there is snow in the forecast, and a low of -9°C, but it will feel more like -19°C overnight.